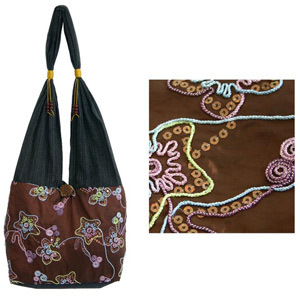 The artisans of northern Thailand handcraft this charming shoulder bag with cotton and polyester. 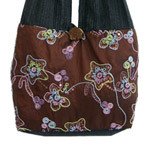 The decorative patterns feature flowers blooming and butterflies fluttering in a brown garden. Golden cords and rain tree wood beads adorn the strap, while the bag fastens with a hoop over an elephant button carved from coconut shell. Fully lined, this versatile accessory features a convenient zipped pocket in the inside to keep small items handy and secure.